We at TEdec are committed to making sure that you are satisfied with your investment in TEdec. That is why TEdec gives you a Risk Free, 100% Satisfaction Guarantee. If you decide that TEdec is not right for your firm, within 30 days from the date of your purchase, simply tell us and we will refund your entire license fee (note: the refund policy does not extend to the processing fees for the EPF program, only the license fee paid by the firm). To insure that you get the maximum benefits with your investment in TEdec, we include at no additional charge access to TEdec University – where you can view short training vignettes that instruct you on how to post some basic transactions in TEdec. the relative ease of learning how to use TEdec. If you suspect that your firm would simply buy the software and put it on the shelf, we recommend that you wait until you are ready to take advantage of the benefits that TEdec delivers – then, we will be pleased to assist you in your implementation. 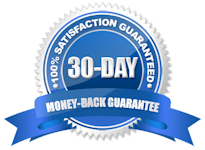 We honor every guarantee – you have my word on it! Teddar S. Brooks, President, TEdec Systems, Inc.